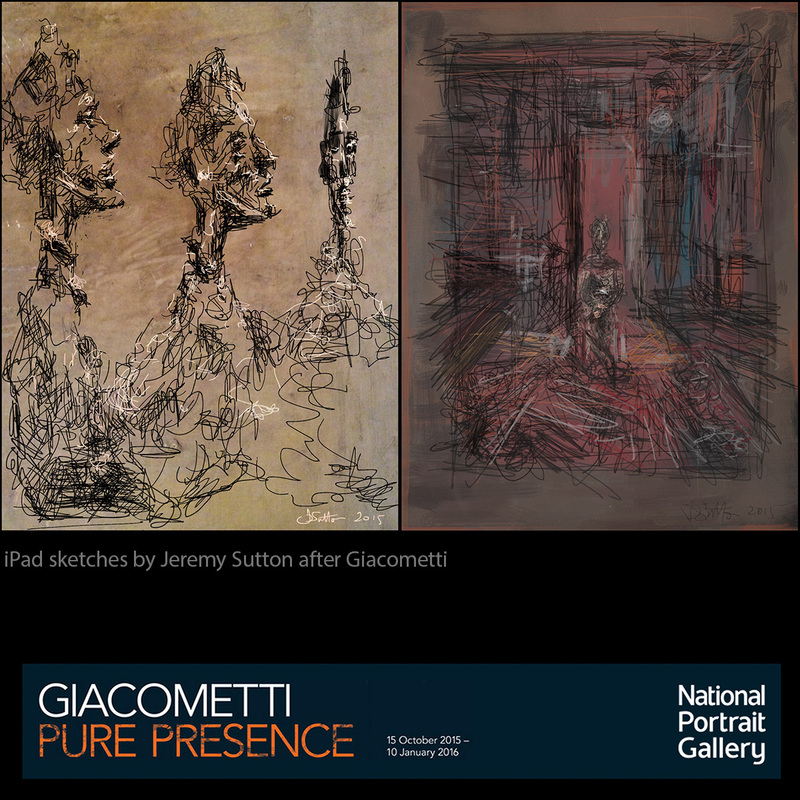 These two iPad sketches were created by me from scratch inspired by, and based on direct observation of, Giacometti’s wonderful work on display at the show “Giacometti: Pure Presence”, London National Portrait Gallery (see the Curator’s introduction and this review). The dark blue horizontal banner at the bottom of the square image is from the NPG London web site. On the left you see my sketches from 3 views of Giacometti’s 1955 sculpture of his brother Diego, and, on the right, my sketch of his 1950 painting of his mother Annetta. Alberto Giacometti is known for his elongated sculpted figures with small flattened heads, but lessor known for his extensive series of portraits (drawn, painted and sculpted) of his family and friends which he created throughout his adult life, and which this exhibition focuses on. I was fascinated to see his early portrait work, in which you can see him experimenting with ways to depict what he sees when he looks at a person. One early sculpture of his father has a flat disc (flattened 90 degrees to the flattening of his later portrait sculptures) with a drawing scratched onto the disc. The painting of his mother that I sketched caught my eye due to the way he treated the space and environment around her, with so much energy and structure. It was fun to mimic his loose scratchy lines, worked into again and again. His sculptural bust of his brother fascinated me by the way it changed so dramatically as you walked around it. I wanted to convey that so I drew it from three different points of view, using very scribbly loose line work that evoked the way Giacometti picked at his sculptures, continually building up and taking away, sometime over months or years. I also just used two colors, charcoal black and a creamy white, to evoke the strong play of light and shadow in the sculpted forms. Interestingly enough, many years ago in the early 1980s, when I was studying sculpture at the Ruskin School of Drawing and Fine Art in Oxford (as an extra curricula activity while reading for my undergrad degree in Physics), I was inspired by this very same Giacometti sculpture of his brother to create my own “Giacometti-style” bust (cast in concrete) of a good friend and fellow Oxford Physics student, Peter. Coming up: iPad Figure Drawing class, Nov 14 (http://www.paintboxtv.com/ipad-figure-drawing), Paint on the Go! Dec 5th (http://paintboxtv.com/paint-on-the-go) and “Paper to Pixels”, my Open Studios Art Show & Sale, Nov 7/8, 11a-6p, 1890 Bryant St, San Francisco.